Our 2017 Road Trip, Part 22: The Commuters Cometh « Midlife Crisis Crossover! 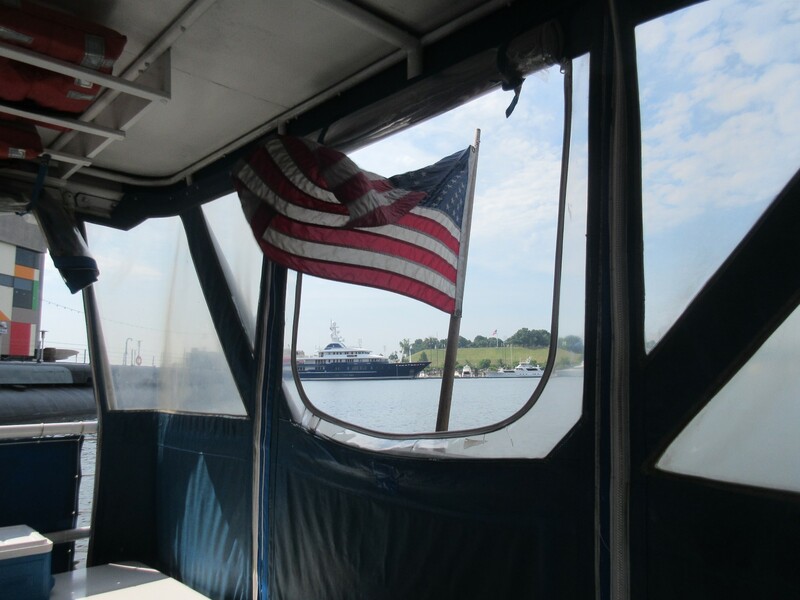 Another water taxi, another U.S. flag waving in the Inner Harbor breeze. As a confident driver with above-average reflexes, limited patience for needless hesitation, navigational skills honed over a lifetime, and a car that responds well to my every need and impulse, I find it excruciatingly difficult to relinquish control of the steering wheel and let someone else drive. Blame it on my upbringing in a large city with a fierce loyalty to the automotive industry; slow, intermittent buses; costly taxis that aren’t a common enough sight to count on; and no commuter rails whatsoever. Indianapolis loves its cars, its car exhaust, and its gridlock. When officials brag about how we’ve expanded our 21st-century travel options, they’ll mention Uber, Lyft, and the BlueIndy electric cars you can rent for a few hours at a time. In other words, more cars. Way to save the world, Indy. On our annual road trips, occasionally we’ll think to sample the mas transit where we’re hanging out. On our 2011 and 2016 road trips, I loved letting the ubiquitous MTA subways carry us all around Manhattan and Queens, but their bus line’s haphazard schedule and incomprehensible route signs drove me bananas. On our 2003 foray into Washington DC, the Metro came in handy for a city where we couldn’t afford many of the parking options at the time. I’ve had mixed reactions to my limited use of mass transit in Chicago, Denver, and Philadelphia. Otherwise, in our travels it’s entirely up to me when and how we get where we want to go. We don’t have to wait for other drivers or share space with other passengers. I save us some time and tend to drive faster than any public transportation professionals except for NYC cabbies, whose tolerances for four-wheel zero-G are beyond my comfort threshold and most speed limit signs. Ultimately, if it takes us longer to arrive somewhere than we should, I’d rather blame myself than someone else. With Baltimore we decided to give their local travel options a shot — partly to save us the hassle of their traffic, and partly to cut back on parking fees in addition to what we were already paying for the garage behind the hotel. If the results wowed us, maybe we could go back home to Indianapolis and tell them what a major city with real mass transit looks like. We may have picked a bad week to try that. 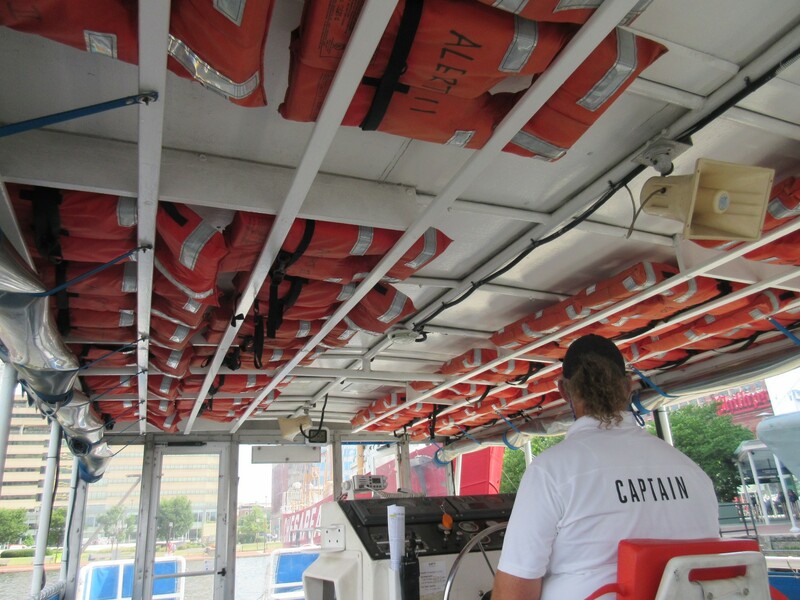 One of our Baltimore water taxi captains, prepared for the worst. For all of Day Three and a little of Day Four, we found Baltimore’s water taxis a pleasant way to get around the Inner Harbor and its variety of scattered attractions. Unfortunately we’d arrived the exact same week that they changed all their schedules and put up new route signs that didn’t match them. The scenery was lovely to view as the breezes caressed us and tried to lull us into forgetting how long the waits were at times. In theory I could’ve simply paid extra to drive us all around the harbor, but then we’d miss out on the water and some extra dollars. The half-hour wait to return from Fort McHenry wasn’t my favorite, nor the morning of Day Four where we showed up far too early and couldn’t find any shade to hide under until taxi launching time. If either of us were the suntanning kind, we might’ve appreciated the extra baking a little more. By Tuesday morning I already had sunburn going for me, with a few more days’ sightseeing still ahead. 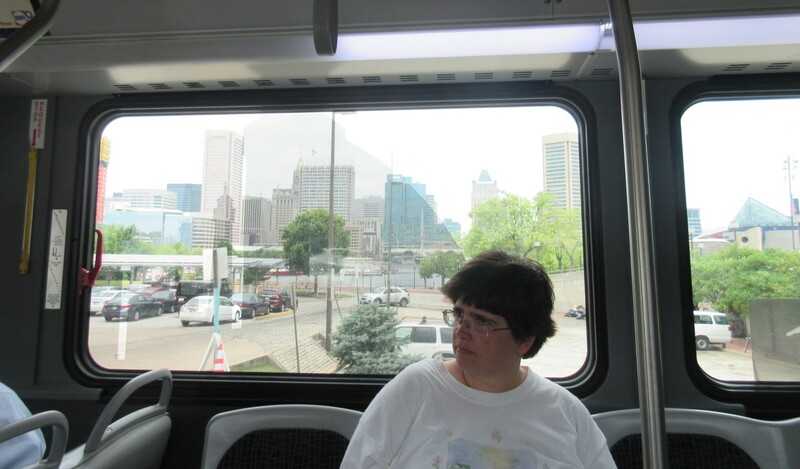 Around lunchtime when we finished at the American Visionary Art Museum, we switched gears and decided to try a ride on the Charm City Circulator. A separate entity from the public buses, the Circulator is a set of privately funded bus lines with circuitous, continuous routes that let everyone ride free to all the prominent places in town. Free is nice. Always keep your bus stop signs straight. Getting on the wrong bus can waste a lot of your time and in certain circumstances be fatal. 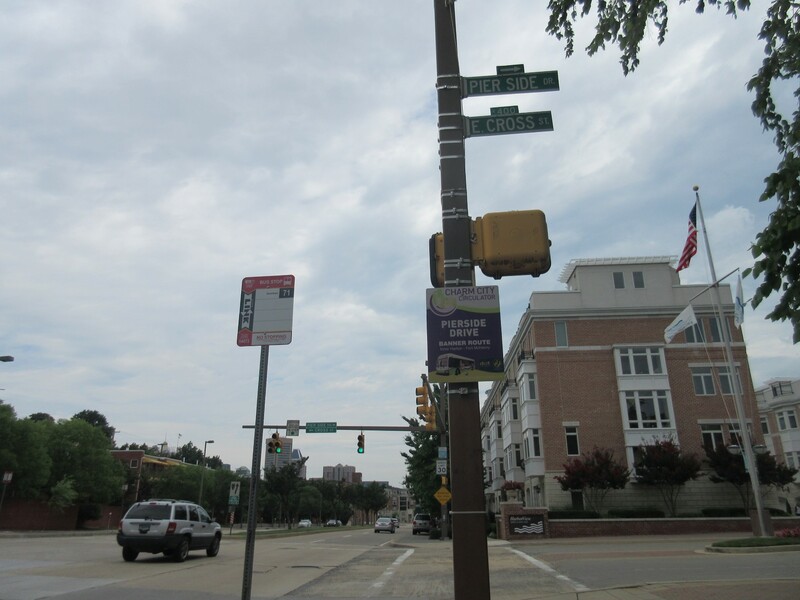 The AVAM stop was a couple blocks south; our destination had a stop three blocks away from it. It would eliminate over a mile of walking in the summertime killer sunshine and save us a few bucks. Wikipedia and the official website agreed a Circulator bus would come by every 10-15 minutes on average. And the bench was friendly. We were compelled to go for it. You did it! Congratulations! Greatest city in America! Great job, everybody! 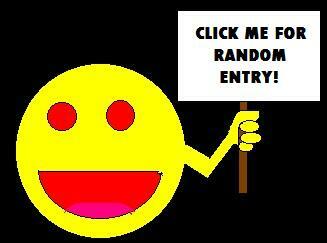 It’s great to be here! Half an eternity ticked by, punctuated by me rising up a little every time I heard a new engine approach from afar. It reminded me of childhood times when my mom took me on the bus downtown for some weekend shopping and walking, or when or my grandma would drag me along for her weekday doctor’s appointments at Wishard Memorial. To me the constant perking-up and inner-monologue chants of “Is it here yet? Is it here yet? Is it here yet?” were a standard part of the bus riding experience. I rarely relive that anymore because today we live in a house nearly two miles from the nearest bus stop. I can commute to work daily if and only if I don’t mind beginning every morning with a long stroll alongside narrow streets with no sidewalks, no breakdown lanes, almost no street lights, and plenty of mud and gullies and deadly nearby cars…and, if I survive, then comes the long bus ride. After our 2011 road trip I used to joke that I wish the NYC subway system could reach our front yard. That’s because my fantasy beats the heck out of our status quo. After forty minutes the next Circulator arrived at last and we were on our way to the next chapter without incident. It would’ve been faster to walk, but more draining. And we wouldn’t have a story to tell. Or the bus air conditioning to enjoy for a few minutes, for that matter. Anne cooling down while downtown Baltimore passes us by. 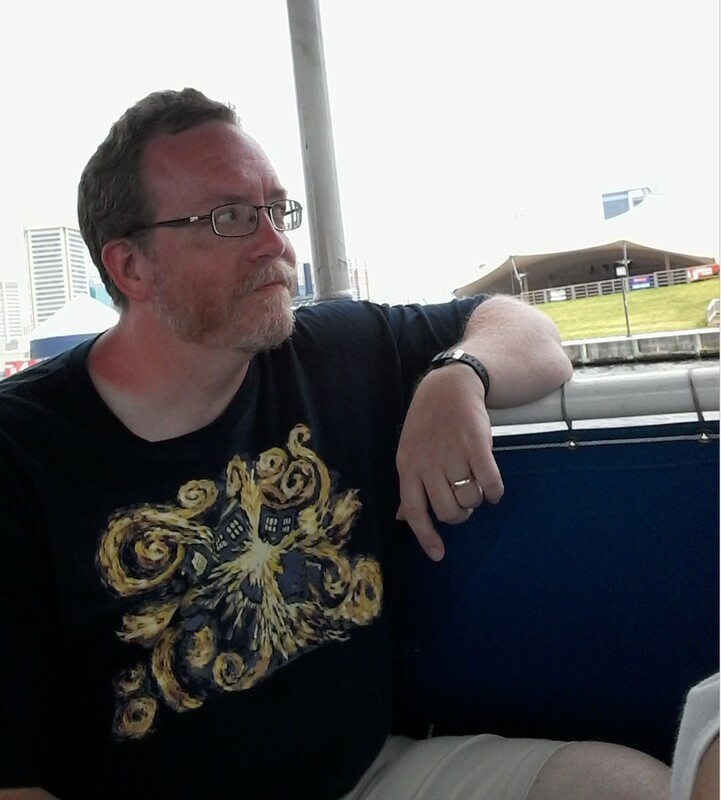 Later that afternoon we tried another Circulator to return to the Inner Harbor. During rush hour, that one was nearly a half-hour wait while we tried to take shelter under the wispy Charlie Brown trees by the curb, scooting down a few inches every few minutes as the Earth’s rotation kept trying to take the pitiful shade away from us. After we and several other folks were picked up, this ride understandably proved much more crowded and awkward and filled with glaring at us tourists trying to take up as little space as possible. 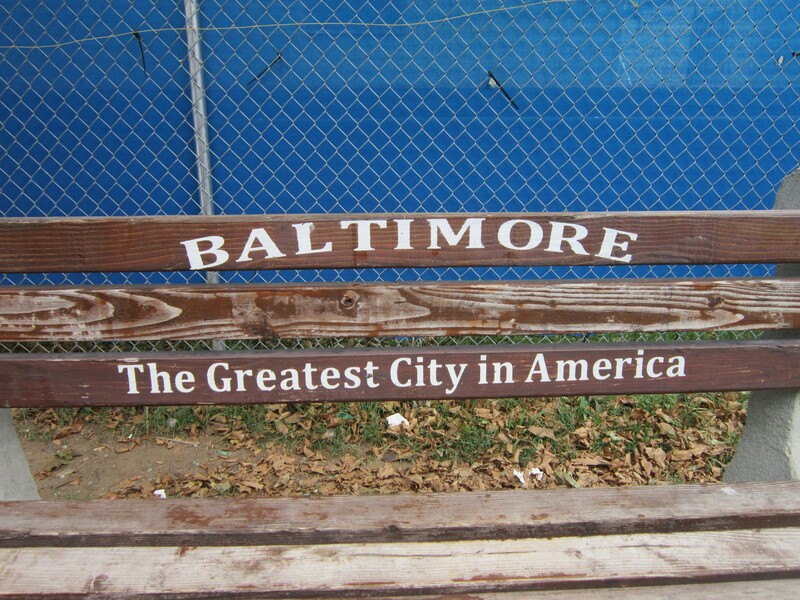 Spoiler alert: for our last round of Baltimore sightseeing on Day 5, all we did was walk. No vehicles, not even ours.